3 Ways To Know If Your Lawn Has Heat Stress! Heat stress can cause many issues for your lawn, including disease, insect infestation, weed infestation, and overall poor health. We'll examine both the warning signs of a lawn that is experiencing drought stress, but also learn the proper lawn care watering methods to nurse it back to health. Soil Gaps - You may have never noticed it before, but as your lawn experiences drought like conditions, the soil actually becomes more compact. Similar to how beef jerky shrinks as it's dehydrated, so does your lawn's soil. How will you notice this? Walk along the perimeter of your sidewalk and driveway, looking for a noticeable gap in between the cement and your lawn. 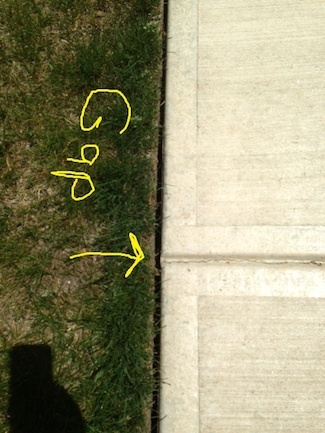 If there's a gap, your lawn is experiencing heat stress. Dryness in Bed Edges - Clean edges around your landscape beds look awfully nice during the summer season. Not only do they look nice, they also serve as a great drought indicator. If your beds have edges around them, it gives you a cutaway look at your lawn's soil a few inches below the surface. If you notice drying "light" colored soil, your experiencing drought stress. "Ghost Footsteps" - Walking around your lawn during the spring you should notice that the "footprints" you leave behind from the grass being stepped on go away after a few moments. During times of heat-stress, the elasticity in your turfs plant walls begins to disappear from dehydration. So a good indicator of heat stress is seeing your footprints in your lawn minutes to hours after being on it. Water Early In The Morning - Watering early in the morning, starting around 5-6 am will allow your lawn to absorb the most amount of moisture without evaporation taking it’s toll. 2-3" of Water Needed - Unfortunately, lawns that are experiencing heat stress begin to become hydrophobic. This means that instead of absorbing water, they actually repel it due to the extreme dryness. As this water sits on the surface, it evaporates and does not soak into the soil. This can cause shallow rooting, in addition to heat and moisture related disease. To combat this, you need to water heavily for the first several days, attempting to reverse the lawn's dryness, and promoting proper hydration. Cycle & Soak - This term is often used by in ground sprinkler manufactures. It refers to a setting on your sprinkler timer that allows you to cycle through all your zones, then repeat it, allowing water to soak in, instead of watering off. Cycling through all your zones, then repeating watering each zone again. Need more instructions on best drought condition watering for your lawn? Well, we have you covered! Download our Free Drought Lawn Care Watering Guide and Calculator to get the exact information on how to care for your lawn during this dry time. To get your free copy, simply click on the button below!